Get ready for the 7th NWIPEC in 2020! 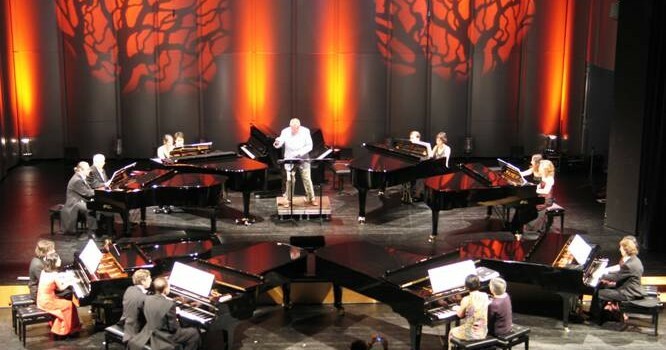 As the 6th North West International Piano Ensemble Competition has wrapped up, preparations for the 7th Competition—which will take place in 2020—has slowly begun. More details and information will be posted as we move on ahead. Thank you to our sponsors—especially Tom Lee Music—for their great support. Without them, this kind of a competition would not be possible or as successful as it is. As always, if you have any questions, comments, or concerns, please do not hesitate to reach out to us. 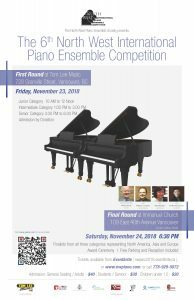 This competition has been birthed from a desire to provide opportunities for talented and advanced piano ensembles to have a platform for their performance of duets and duos. Piano students are encouraged to explore the vast repertoire of music, other than arrangements, that is available for such performances. Many serious students of the piano have experienced the desire to play with other musicians and to enjoy the social aspect and camaraderie of music making. Piano playing, though by itself a great art with much deep satisfaction, can be lonely at times. Therefore, since the time of Mozart, piano duets and duos have been a regular creative means of engaging in music-making with someone(s) else. This competition is the only one of its kind in Canada and should be viewed as a great chance to show what can be done when two talents unite in one exhilarating performance. This competition started in 2009, and has had six successful competitions since then. It runs every second year, the next being in November 2020. 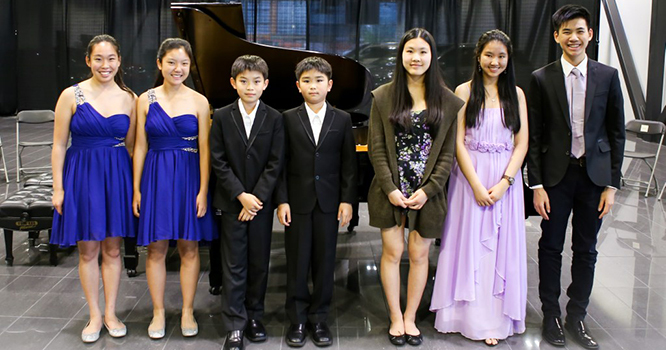 The competition has attracted very gifted pianists from several continents. We are proud to say that some of the past contestants have gone on to pursue professional musical careers and have performed with major orchestras both at home and abroad. Our judges have been from Europe and North America and have contributed to attract great talent. The Bergmann Duo, Professor T. N. Baynov, Jeroen van Veen, Dr. Terence Dawson and Linda Lee Thomas were much appreciated for their international reputation and the high standard they placed in this competition. "The Northwest International Piano Ensemble Competition has been one of my most precious memories along my musical journey. It is a rare opportunity that I am so grateful to have had in my life." 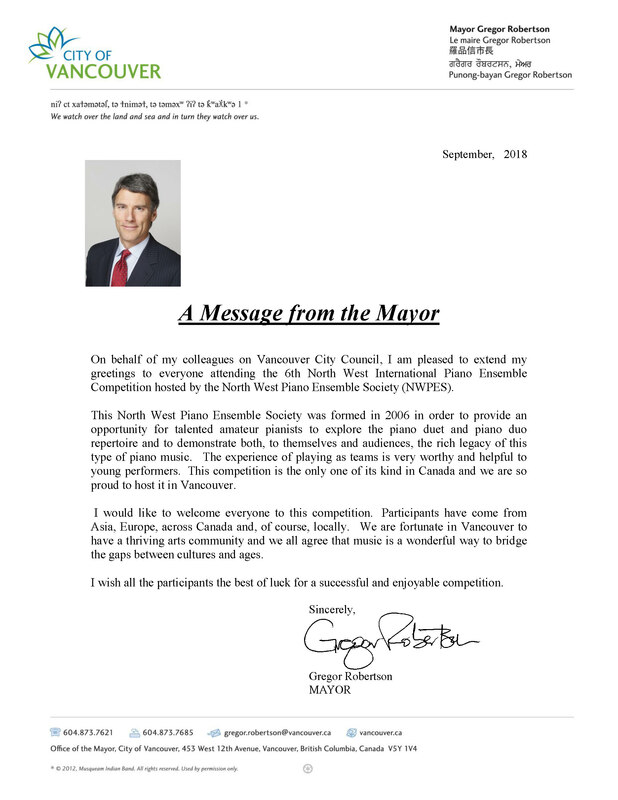 "To participate in the only piano ensemble competition in Canada is truly a remarkable opportunity and experience that I will treasure for a lifetime"
“On behalf of my colleagues on Vancouver City Council, I am pleased to extend my greetings to everyone attending the 6th North West International Piano Ensemble Competition hosted by the North West Piano Ensemble Society (NWPES). 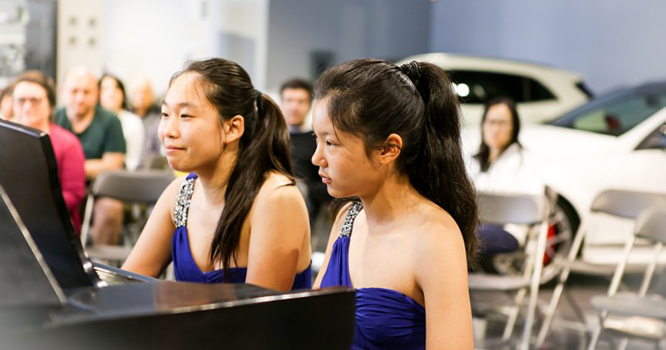 This North West Piano Ensemble Society was formed in 2006 in order to provide an opportunity for talented amateur pianists to explore the piano duet and piano duo repertoire and to demonstrate both, to themselves and audiences, the rich legacy of this type of piano music. The experience of playing as teams is very worthy and helpful to young performers. This competition is the only one of its kind in Canada and we are so proud to host it in Vancouver. I would like to welcome everyone to this competition. Participants have come from Asia, Europe, across Canada and, of course, locally. We are fortunate in Vancouver to have a thriving arts community and we all agree that music is a wonderful way to bridge the gaps between cultures and ages. Without the generous support of our sponsors and donors, we would not be where we are today. The NWPES is a registered non-profit organization and we rely on the support of the community to help us make the competition as successful as it is. We invite you to get involved, whether it be as a volunteer, donor, or sponsor.